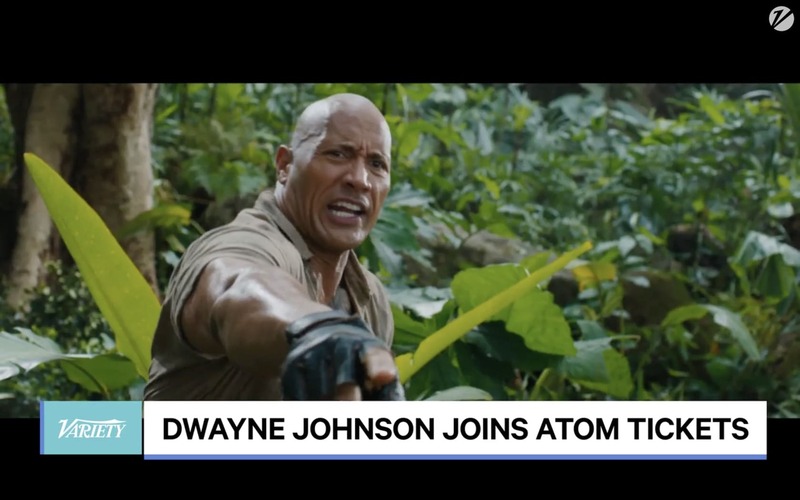 Atom Tickets is bringing more high-wattage Hollywood electricity on board: Dwayne Johnson and his business partner Dany Garcia have teamed with the online-ticketing startup as investors and advisers. Johnson and Garcia, who were formerly married, are the co-founders of Seven Bucks Productions…In their advisory roles, Johnson and Garcia — along with other Seven Bucks execs — will provide guidance to the growing startup. They join filmmakers Steven Spielberg, J.J. Abrams, and Tyler Perry on Atom Tickets’ board of advisers. The December box office is one of the busiest times of the months, which means your local theater will be more crowded than ever. This is the month that pre-ordering your tickets is a must, and Atom Tickets is making it a little easier. “Aquaman,” “Venom,” and “Fantastic Beasts: The Crimes of Grindelwald” are the upcoming movies that female moviegoers are most excited to see, according to a survey by Atom Tickets. Online ticket service Atom Tickets has launched a sweepstakes for anyone dumping MoviePass. Although the film never reveals who Sophie's dad is, fans do have their suspicions. Atom Tickets recently surveyed customers about the mystery, and the results were pretty mixed. Big things are coming to the Star Wars franchise later this month when Solo: A Star Wars Story hits theaters. The movie ticketing service has added 1,000 screens to its platform. Advance mobile ticket seller Atom Tickets also reported a company record that they sold more tickets to T’Challa than any other superhero movie. The movie has had a higher average group size ticket order than any other superhero movie. New York City, Los Angeles, Atlanta, Washington DC and Chicago repped the top markets for Atom ticket buyers. The paid sneak will take place at 1,000 Regal, AMC, ArcLight and National Amusement theaters nationwide, with the gimmick being that Amazon Prime members will get the first bite at the apple. Oh, and tickets will be sold will be exclusively sold through Atom Tickets and IMDB, powered by Atom, so that's a boost for the relatively new (and social media-centric) online ticketing app. Announced today, the cutting-edge mobile movie ticketing platform Atom Tickets and T-Mobile are teaming up again to bring T-Mobile customers an exclusive ticket offer to see 'My Little Pony: The Movie' for $2 through the T-Mobile Tuesdays app. Some Facebook users have noticed a new section called “Movies” appearing in the mobile app’s main navigation. The feature, which has just appeared for many U.S. Facebook users, offers a way to see which movies are playing nearby, available showtimes and a list of local theaters and their movie selections. The annual mega-launch of new Star Wars merchandize is an exciting day for many. For the wannabe Jedi, today’s toy bonanza is not only an opportunity to stock up on the latest Millennium Falcon sets, but also a way to get a sneak peek into some of the upcoming characters in the next installment of the popular film series. Moviegoers to B&B Theatres, Flix Brewhouse and Southern Theatres will soon be able to buy their tickets in advance through Atom Tickets. The Santa Monica, California-based mobile movie ticketing app also has made good on a partnership announced in January, launching on 267 screens in Bow Tie Cinemas locations. The three new exhibitors add 891 screens to the platform, bringing Atom Tickets’ service to a total of 18,500 screens across North America. One means for Lionsgate to cut through the social media distraction that moviegoers continually face was by partnering with T-Mobile and Atom Tickets for their ‘T-Mobile Tuesdays’. They gained access to 50M impressions via T-Mobile’s promotional efforts. Eighty percent of Atom’s Hitman’s Bodyguard ticket buyers were 39 or younger. The mobile ticketing app has seen more than twice their movie ticket sale volume driven by the T-Mobile promotion. Atom Tickets, the cutting-edge theatrical mobile ticketing platform, is partnering with Paramount Pictures and Participant Media to offer its users the chance to join the conversation with access to special public screenings featuring a Q&A with Al Gore for An Inconvenient Sequel: Truth to Power, the inspirational sequel to the Oscar-winning documentary about climate change. Atom Tickets and Chase Pay® are making it simpler for movie fans to plan, order and pay for their theatre experience entirely from their mobile device. For the July 11th edition of T-Mobile Tuesdays, T-Mo customers can get a $4 ticket to see War for the Planet of the Apes. The movie opens on July 14th, and T-Mobile says that the $4 ticket will be good through opening weekend. New mobile movie ticketing platform Atom Tickets and T-Mobile are bringing Paramount Pictures’ Transformers: The Last Knight to millions of T-Mobile customers with an exclusive offer through the “T-Mobile Tuesdays” app. Starting Tuesday, June 20, T-Mobile customers can redeem the exclusive offer from the T-Mobile Tuesdays app and purchase their tickets on the Atom Tickets app. Regal Entertainment Group, a leading motion picture exhibitor that owns and operates one of the largest theatre circuits in the United States, reveals a new website developed in partnership with Atom Tickets, the fastest-growing movie ticketing platform in North America. The new REGmovies.com provides a modern, user-friendly experience that allows moviegoers to browse movies, watch trailers, view exclusive movie content and purchase tickets in one place. Over the weekend, Wonder Woman charted the best opening for a film by a female director (Patty Jenkins) with $103.25M, and arguably the fourth-best debut for the first chapter of a solo superhero franchise. Last Tuesday, Wonder Woman set a record on Atom Tickets for the most tickets sold on the movie ticket app for any title in a 24-hour period. The Atom cross promotion offered $4 tickets to T-Mobile customers to see Wonder Woman during its opening weekend. Atom Tickets, the first-of-its-kind mobile movie-ticketing platform, announced a partnership with Bow Tie Cinemas, the oldest theatre circuit in North America, that will expand its availability in New York, New Jersey, Connecticut, Colorado, Maryland and Virginia. Mobile ticketing app Atom Tickets has partnered on a year-long free movie ticket campaign on Fridays with the iHeartMedia radio network, Variety has learned exclusively. Free Movie Friday — which kicks off this Friday — will offer thousands of free movie tickets every Friday for an entire year across iHeartMedia’s radio stations and digital platforms through more than 500 radio stations in over 100 markets across the country. Atom Tickets, a Santa Monica, Calif.-based mobile movie ticket app maker, will enable users to pay via Chase Pay early next year, as JPMorgan Chase & Co. spreads its digital payments solution beyond brick-and-mortar merchants. Online movie ticketing app Atom Tickets is expanding its pre-order food and beverage service to include AMC Theatres in addition to Regal Theatres. The enhanced service, which begins rolling out Thursday at 28 AMC locations across the country, is designed to allow customers to avoid standing in regular concession lines. ‘Force Awakens’ Deja-Vu: Did ‘Rogue One’ Presales Crash Online Ticket Servers Tonight? If you were buying advance tickets to Disney’s Rogue One: A Star Wars Story tonight, you may have waited 20-30 minutes before your purchase was complete, or worst case scenario — you were timed out... The long lines at Fandango, prompted its competitor Atom Tickets to scream like C3-PO in Star Wars, “Over here! Hey! Hey!”, as the company, as well as a slew of people on Twitter, observed the short wait on the ticketing platform app and began tubthumping it. Atom Tickets lets you pre-order movie tickets and popcorn, splitting the cost with a friend. Ader connects marketers with video-game enthusiasts who’ll talk about their products while playing competitively online. And Pley lets you rent toys from brands like Lego and American Girl for a $13-a-month subscription fee. Those companies are among nine that participated in Walt Disney Co.’s Accelerator program this year. Can Selling Saved Seats Save Movie Theaters? Atom Tickets Co-Founders Matthew Bakal and Ameesh Paleja on the startup's app that aims to make the experience of going to the movies easier. Dynamic pricing, group sales, and high-profile partnerships. Can a start-up revolutionize mobile ticketing? “Captain America: Civil War” kicks off the summer moviegoing season next weekend with the kind of blockbuster event that’d be fun to experience as a group. But between picking a day and showtime, finding a theater, and figuring out who’s going to pay for the tickets (and then chasing down your buddies to pay you back), who has the time or energy? Going to the movies is only partly about the images on screen -- it's a social experience, too -- and a mobile application just launched at Knoxville Regal Entertainment locations is meant to tap into that. Atom Tickets, a Santa Monica-Calif.-based startup, has produced an app that is designed to make the movie experience -- from buying tickets and popcorn to rounding up friends to see a film -- as seamless and convenient as possible. Three studios are leading a $50 million investment in a new company looking to solve one of Hollywood's oldest problems: How to get more people into movie theaters. Walt Disney Co., 21st Century Fox's Twentieth Century Fox, and Lions Gate Entertainment Corp. are backing Atom Tickets, a mobile startup that can organize groups to go to movies and enable discounts for less-popular screenings, a controversial practice in the industry. Atom Tickets Partners With UberEATS For Free Private Screenings Of New Movie "The Founder"